Earlier this year, Downtown Donuts opened its doors in downtown Concord, North Carolina. "This picture is before #4. Maybe in a couple more years the stars will align for us to get another family picture!" Downtown Donuts' owners proudly state that they are not a chain, but in fact a family owned business. 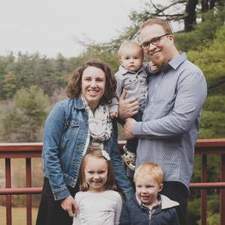 It is run by husband and wife team Katy and Nate Ernst. They have four children and have lived in the Concord area for over 8 years. Feeling there was a need for a tasty, family-feel donut shop, they decided to open up Downtown Donuts. Their hope is to have their customers really enjoy their time visiting. We wanted to learn a little bit more about their history, as well as their eclectic donut selection, so we reached out to them. Katy and Nate answered a few questions for us. Tell us a little about the Downtown Donuts. When and how did it get started? We live near downtown Concord and for years we've talked about opening a business downtown. We love to see the downtown area thriving, and its been great to see all the cool businesses that have invested there. We were talking about it one day and Katy mentioned how popular donuts were getting, and what a great business it would be to have downtown. Tell us a little bit about yourself. What is your role there? We are the owners of Downtown Donuts. It's not a chain, so we have had to figure out each aspect of the shop. We were originally working 14+ hour days there, but as we've built out an awesome staff, we've been able to step away a little more. We are still involved daily, but we don't have to be there at all times. How has the welcome into the community been? Has it been supportive? Concord has been wonderful to us. We thought donuts would be a good fit, but we've been floored at just how much support we've seen from customers. We've also received support from other business owners downtown. In particular, the owners of the Cabarrus Creamery were (and continue to be) extremely helpful. And of course their ice cream is really delicious too. What is your most popular item (so far)? Our most popular item is probably our Churro donut. It's a simple one, tossed in cinnamon sugar, and drizzled with vanilla. 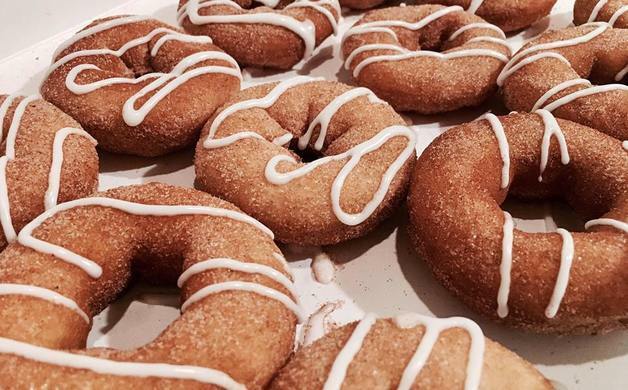 Something about a warm, slightly crispy donut pairs well with cinnamon sugar. What would you recommend? Do you have a favorite? Katy: My favorite is the Churro donut. You can't go wrong with it. Nate: My favorite has to be one of the fruitier donuts. I like the Tutti Frutti, or the Blueberry Hill. The Tutti Frutti is lemon icing with Fruity Pebbles on top. And the Blueberry Hill is blueberry icing dusted with powdered sugar. Is there something you just love making? We're thrilled when we hear people had a great time coming to the shop. We're making hundreds of donuts a day, so it's fun to hear that these donuts are making people's day. Maybe they're going to a birthday party, or making your coworkers smile at work. Sometimes people are grabbing them on their way out of town for vacation, or bringing their out of town friends and relatives to visit. We have lots of folks who just grab a coffee every morning, or grab a few donuts every week. There are tons of reasons that bring people in, and it's so rewarding to know we're a part of the community, and a fun part of people's day. We love making people's day. We are committed to contributing to the downtown Concord community. We have used as many local resources as possible. Our shirts are all screen printed around the corner at DaVinTee, we used local contractors for the work on up-fitting the space, local barn wood for building out all the counters at the shop, our flowers are brought in every week from a local nursery (Curiosity Farms), our coffee is from Dynamite Roasting out of Black Mountain, NC, and our mugs are handmade in Mint Hill by Maria Frey at her Potteria Studio. A couple weeks ago we offered Apple Cider Donuts for only 2 hours on a Sunday. We'll do something similar in the future, so check our Facebook page and website for when the next one might be. Visit Downtown Donuts at 21 Union St, N Concord, NC. Keep up with the latest donut creation by visiting their Facebook page or website at: facebook.com/DowntownDonutsNC and DowntownDonutsNC.com.